My first column when I came back from last year’s summer sabbatical was on the U.S. Patent and Trademark Office’s (USPTO) PatentsView project. PatentsView became one of the Department of Commerce’s most viewed apps in 2015. 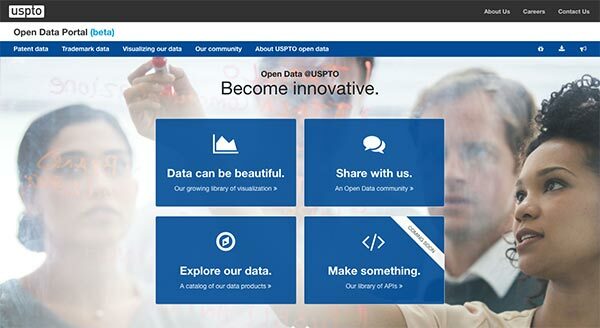 Building on this success, USPTO released a beta version of its open data portal. Patent and trademark data offers interesting insights into U.S. business activity and, especially, the state of innovation in America. Flipping through the visualizations section, you can see the number of trademark applications submitted in any given period, state job data compared to patent filings, and the rise of green technology patent filings. It would be interesting to take patent and trademark datasets and combine that data with Census Bureau data and Bureau of Labor Statistics data to better understand how to increase and nurture innovation. As more agencies create or build out their open data portals, the benefit to the American people of combining open data can only grow greater. (Disclosure: I work at the U.S. Patent and Trademark Office. The opinions contained in this posting are my own and do not reflect the views of the U.S. Patent and Trademark Office.) Each week, The Data Briefing showcases the latest federal data news and trends. Dr. William Brantley is the Training Administrator for the U.S. Patent and Trademark Office’s Global Intellectual Property Academy. You can find out more about his personal work in open data, analytics, and related topics at BillBrantley.com. All opinions are his own and do not reflect the opinions of the USPTO or GSA. « How Can Civic Hacking Help Micro-businesses?